More stuff they don’t teach you in medical school. More proof that medical school is a drug company funded conspiracy. Yes we need term limits. Our leaders are lo-o-o-o-o-ng overdue for term limits. Big media figures are cultural change agents. They are paid whores who do the elites’ bidding, even if it portrays them negatively. Mike Duffy is no different. A media personality paid off with a Senate appointment, he is then used to give the people what they allegedly want, an elected Senate. Elected senates may placate the people, but they will make no difference to the prols’ lives. The phony trial resulted in three years of distraction. It’s a setup for future change. Mike Duffy got paid well for doing his job, even though it’s with a nudge and a wink from the power players that he’s a bad man. There are some moments when stunned silence speaks for itself. 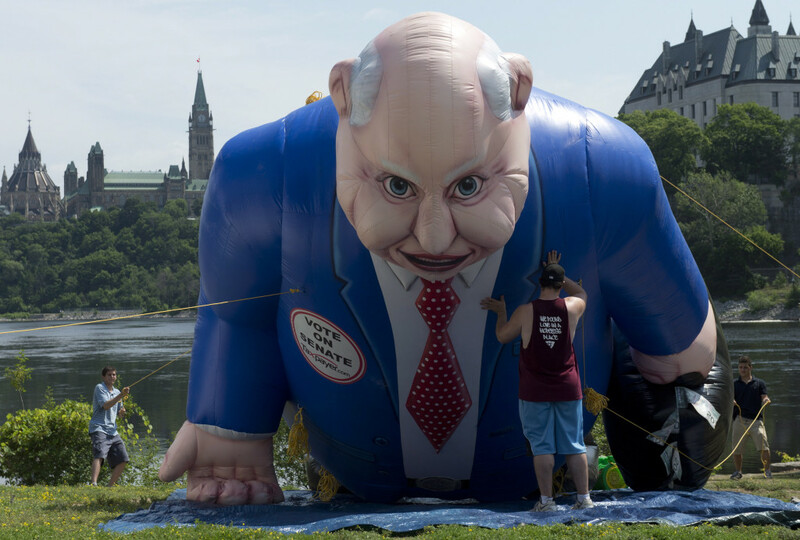 Watching hot air inflate a larger-than-life Senator Mike Duffy, his briefcase brimming with $20 bills, at the edge of the Ottawa river, framed by Parliament Hill in the background, is one of those moments. Scott’s right on this one. Why do you think auto recalls actually help business? By analogy, restaurant owners know that the most loyal customers are the ones who had a complaint that got resolved to their satisfaction. People are usually more invested in the fix than the complaint. If a restaurant gets the fix right, the customer bonds for life. Trump got it wrong with abortion penalties, but his fix was swift and unambiguous. Voters notice the fix. And they bond to it. Are you a what iffer or so whatter? 98% is unknown unknowns, while 1% is known unknown and 1% is known knowns. I really enjoy Sophia’s philosophical musings. Posted on April 16, 2016 Categories AudioLeave a comment on Are you a what iffer or so whatter? Update 4/9/16: I went ahead and ordered a Lillipad. It’s pricey, but it is coming from the other side of the world and is heavy. I’ll do a video (?) once installed. I chat about it with Tom here.